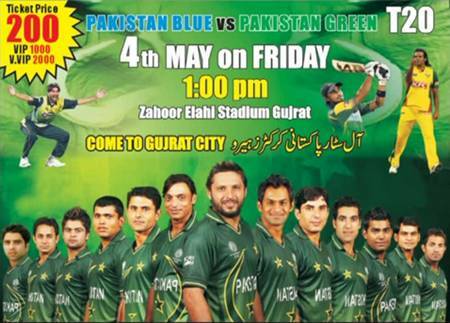 A T20 Cricket Match will be played in Zahur Ellahi Stadium Gujrat on Friday 04 May, 2012 at 01:00pm. Pakistan’s top national cricket players will be seen in action in this match. Both teams will be led by former captains of Pakistan Cricket Team; Shahid Afridi and Shoaib Malik. Shahid Afridi will lead the Pakistan Greens team having Kamran Akmal, Umer Akmal, Adnan Akmal, Azhar Ali, Rao Iftikhar, Taufeeq Umer, Imran Farhat, Saeed Ajmal, Sohail Tanveer and Aizaz Cheema. Shoaib Malik will lead Pakistan Blues Team comprising Abdul Razzaq, Shoaib Akhtar, Misbah ul Haq, Abdur Rehman, Imran Nazir, Rana Naveed ul Hassan, Shahid Yousuf, Naved Latif and Shakeel Anjum. This is a fund raising match to establish a Cricket Academy "Rana Naveed Cricket Academy" in Sheikhupura. Rana Naveed is the organizer of this match. He said that he is planning to organize such charity matches in Sialkot, Faisalabad and other cities. Inzamam ul Haq will be chief Guest of the match. The event of T20 Cricket Match of 4th May 2012 in Gujrat became unsuccessful. There may be several reasons behind this but mismanagement and uncontrolled crowd were main reasons. There was a huge crowd of people from whole district Gujrat and its surrounding cities who came to see the match returned disappointed. Match was started late and then it was shortened to only 10 overs after collapse between people and organizers. 10 Overs match was won by Shoaib Malik's Pakistan Blue. Please share your views and thoughts about this event. well it was a real delight for the people of Gujrat !! !